Chicago, Ill. – (Sept. 19, 2016) – Argo Tea®, the Chicago-based premium tea brand known for its all-natural tea-based signature drinks and premium loose-leaf teas, today announced its newest café menu offering, the Cocoa Mate shot. Originating from the yerba mate plant, Argo Tea’s Cocoa Mate shot offers an all-natural energy shot on-the-go. Available both hot and iced, the shot embodies a sweet, bold flavor, fusing the vitamins and minerals of Brazilian Mate with cocoa and sweet almond flavors. 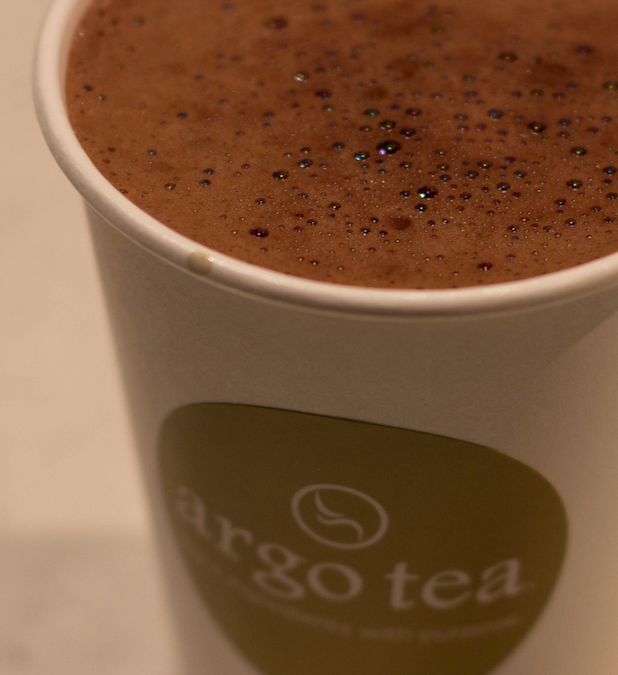 Argo Tea froths the beverage with rich cocoa powder and finishes with a touch of pure cane sugar to enhance the drink’s natural sweetness. Also, making a return to Argo Tea’s menu this fall is the café’s popular Pumpkin Chai. The caffeine-free seasonal favorite combines sweet and spicy rooibos chai with the smooth flavor of pumpkin. To commemorate its return, Argo Tea is offering guests a free small (12 oz.) Pumpkin Chai on Saturday, Oct. 1 from opening until noon at participating Argo Tea cafés. The Cocoa Mate shot is the latest innovation from Argo Tea’s new rotating Mixology Special which previously featured the Matcha Shot. The new offering is now available in participating Argo Tea cafés in one 8 oz. size ($2.95, 40 calories) The Pumpkin Chai is available in three sizes: 12 oz. ($3.95, 155 calories), 16 oz. ($4.95, 210 calories) and 20 oz. ($5.45, 265 calories). Bardstown, KY (September 14, 2016) – After nearly three years in development, the Bardstown Bourbon Company (BBCo) today achieved another major milestone with the start of commercial production. The Company also announced that it’s already preparing to expand because its collaborative whiskey, bourbon, and rye distilling program is sold out, based on the current capacity of the distillery. The distillery’s 1.5 million proof gallon capacity can be expanded to more than 6 million proof gallons within the current design, by adding additional equipment, which allows BBCo. to take on new customers in 3rd quarter 2017. Under construction since October 2014, The Bardstown Bourbon Company is a celebration of the art of making whiskey. No secrets, mythical stories, or fabricated legends, the Bardstown Bourbon Company celebrates the craft of making great whiskey and the Bardstown community that brings bourbon to the world. The Company is developing a $25 million destination experience with a first-of-its-kind Napa Valley style campus featuring a state-of-the-art whiskey distillery, unique and transparent educational experience, integrated visitors center, event space, whiskey library and bar, and eventually a restaurant and boutique hotel.